BAGHDAD, Iraq (CNN) -- All 12 people aboard a U.S. Army Blackhawk helicopter were killed when it went down northeast of Baghdad on Saturday, the U.S. military said. Later in the day, five U.S. soldiers were killed and three wounded when the Karbala Provincial Joint Coordination Center was attacked by an armed militia group using grenades, small arms and indirect fire, the military said. Eight passengers and four crew members died in the helicopter crash. Their identities were being withheld pending notification of next of kin, the military said in a statement. A Diyala province security official said the helicopter crashed in Tarkhya, south of the Diyala provincial capital of Baquba. The province is a mixed and volatile jurisdiction northeast of Baghdad and is considered one of the country's more violent spots. The military did not disclose exactly where the craft went down or the cause of the incident. "Emergency coalition forces responded and secured the scene," the military said in a statement. Last month, a U.S. Marine died when a CH-53 helicopter he was riding in crashed just after takeoff in Anbar province. In Karbala, a U.S. commander said a militia attacked a center where Iraqi and coalition forces convene to discuss and coordinate security operations. "A meeting was taking place at the time of the attack to ensure the security of Shiite pilgrims participating in the Ashura commemorations," said Brig. Gen. Vincent K. Brooks, deputy commander for Multi-national Division -- Baghdad. 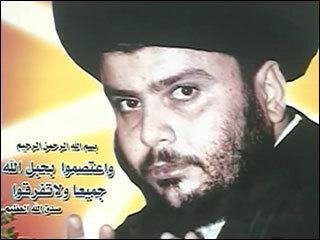 The location of the attack was secured by coalition and Iraqi security forces, the military said. An Iraqi Interior Ministry spokesman had earlier reported that several mortar rounds exploded outside the provincial government complex, despite tight security there because of the start of the Shiite holy month of Muharram. No casualties were reported, Brig. Gen. Abdul Kareem Khalaf told CNN, adding that the rounds had struck the perimeter of the complex. The Pentagon later reported the U.S. casualties. Shiite pilgrims have been flocking to Karbala, south of Baghdad, to take part in the rites of Ashura, which begins in 10 days, and to commemorate the martyrdom of Hussein, the grandson of the Prophet Mohammed. Karbala has two of the holiest shrines for Shiites -- the Imam Hussein and Imam Abu Fadhel al-Abbas -- and attacks have disrupted Shiite religious occasions in the past, Khalaf said. Also on Saturday, the military announced that two U.S. soldiers and a Marine were killed in separate incidents in Iraq. A roadside bomb killed a Task Force-Baghdad soldier and wounded another Saturday in northern Baghdad. A Task Force Lightning soldier in Tikrit died Friday when a roadside bomb exploded, and a U.S. Marine was killed in combat Friday in Anbar province. The deaths bring the U.S. military death toll to 3,029 -- and 32 for the month of January. Seven military contractors also have been killed since the U.S. invasion. U.S.-led coalition forces arrested 25 terrorist suspects, including the driver of a senior al Qaeda leader, according to the U.S. military. The raids in western Baghdad and the cities of Tarmiya, Falluja and Balad were targeting al Qaeda members and terrorists involved in suicide attacks and the smuggling of foreign fighters into the country, the military said. No U.S. or coalition troops were hurt, the military reported. Separately, Iraqi security forces backed by U.S. air power killed 15 insurgents and detained five wanted people during a dawn raid Saturday, according to an Interior Ministry spokesman. The operation happened in the southern Baghdad neighborhood of Dora, Khalaf said. Iran protests U.S.-initiated arrests to U.N.
Iran has sent a letter of protest to U.N. Secretary-General Ban Ki-Moon protesting the U.S. arrest of five Iranians in Iraq as illegal and a violation of Geneva Conventions and calling for a response by the Security Council. The letter called on the United States to release the detainees, return seized property and compensate for damage caused to Iran. U.S. defense officials in Washington earlier in the week said they had gathered substantial information and equipment pointing to a role by Iran's Revolutionary Guard al Quds in Shiite militias. Iran has called the building that was raided a "consulate," but the Iraqi government calls it an Iranian liaison office. Six Iraqis died and 15 more were wounded when a bomb exploded on a minibus traveling on a busy street in central Baghdad Sunday morning, an Interior Ministry official said. In a separate incident in eastern Baghdad, at least one person was killed and five were wounded when a bomb left in a parked car exploded, the official added. Gunmen killed eight people in Baghdad on Saturday, and 29 bodies were discovered across the capital, many showing signs of torture, an Interior Ministry official said. An officer with an Interior Ministry investigative unit was gunned down while driving in eastern Baghdad. 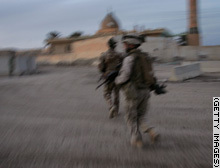 American and Iraqi soldiers patrolling a mosque Saturday in Ramadi, Anbar province, run for cover from insurgent snipers.